The panther chameleon was first described by French naturalist Georges Cuvier in 1829. Its generic name (Furcifer) is derived from the Latin root furci meaning "forked" and refers to the shape of the animal's feet. The specific name pardalis refers to the animals' markings, as it is Latin for "leopard" or "spotted like a panther". Panther chameleons are zygodactylous: on each foot, the five toes are fused into a group of two and a group of three, giving the foot a tongs-like appearance. These specialized feet allow the panther chameleon a tight grip on narrow branches. Each toe is equipped with a sharp claw to gain traction on surfaces such as bark when climbing. Their eyes are the most distinctive among the reptiles and function like a gun turret. The upper and lower eyelids are joined, with only a pinhole large enough for the pupil to see through. They can rotate and focus separately to observe two different objects simultaneously. Panther chameleons have extremely long tongues (sometimes longer than their own body length) which they are capable of rapidly extending out of the mouth. The tongue extends at around 26 body lengths per second. The tongue hits the prey in about 0.0030 sec. The tongue of the chameleon is a complex arrangement of bone, muscle and sinew. At the base of the tongue, a bone is shot forward, giving the tongue the initial momentum it needs to reach the prey quickly. At the tip of this elastic tongue, a muscular, club-like structure covered in thick mucus forms a suction cup. It is a common misconception that chameleons of any kind can change colour to match any colour of their environments. All chameleons have a natural colour range with which they are born, and is dictated by their species. Colour change is, for the most part, subconscious. It is affected by temperature, mood, and light. If, for example, the colour purple is not within the range of colours to which their particular species can change, then they will never turn purple. 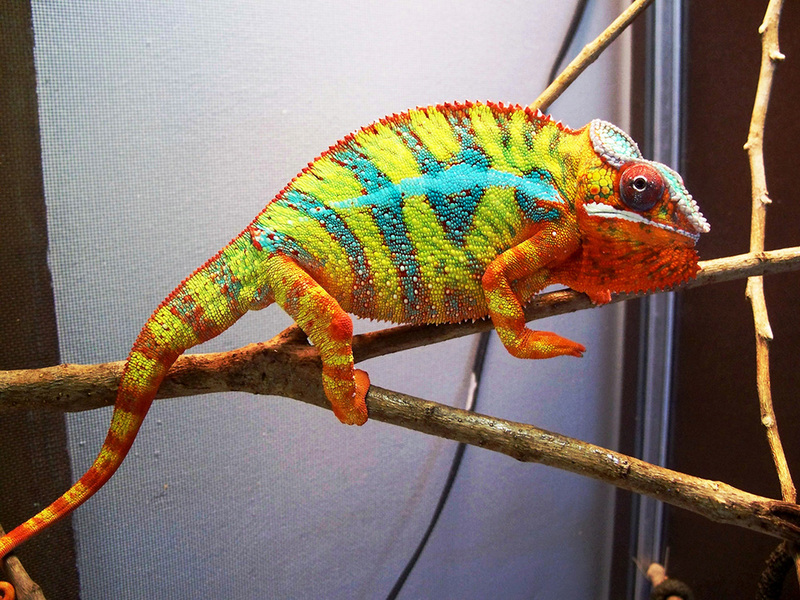 Click HERE for a Panther Chameleon care sheet.